Samsung Android devices to get better music making apps? 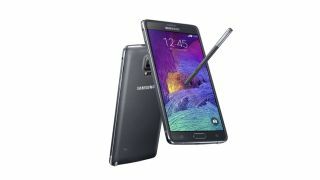 Could Samsung's new Galaxy Note 4 end up being a viable music making device? Apps that require real-time audio and MIDI have always been something of a no no on Android devices - hence the dominance of iOS in the music making area - but new developments from Samsung could mean that, on its own phones and tablets at least, things could be looking up. Firstly, there's the Samsung Professional Audio SDK - a new development platform that, if we're reading things right, should enable third-parties to create Android virtual instrument apps that have MIDI support and offer low-latency audio performance. Interestingly, this includes full support for the JACK Audio Connection Kit, a long-standing audio/MIDI routing solution that was previously launched for iOS, and should enable you to use music making apps together. Samsung is also releasing Soundcamp, an 8-track mobile DAW that will be able to have third-party instrument apps plugged into it. And in further good news, it appears that Sonosaurus is preparing to release ThumbJam, its popular iOS music making app, for Samsung devices. The Galaxy Note 4 and Note Edge are set to get it first, but it should also be available for the Note 3 and S5 at a later date. Is this a watershed moment for music making on Android, then? There have been too many false dawns for us to get too excited, but we certainly hope so. With any luck, we'll know more after the Samsung Developer Conference 2014, at which a Soundcamp and Professional Audio session is on the agenda. The event takes place between 11 and 13 November. Of course, all of this only really applies to users of a specific range of Samsung devices, but if everything works, we can only hope that it will inspire someone to create a wider-reaching real-time audio development platform for Android.